As I was saying, we had a long drive out to West Texas. Actually, it only took 6 h 30 m, with a stop. But two friends who haven’t seen each other in months… well, we used the time catching up. This part of Texas is remote. There are no lights along the route into the town of Fort Davis. When you can finally see the town around the corner, it is a dim light in a black night. Only about 4 blocks long, the town sits on either side of the highway, and nothing was open at 11:30 pm. We had called ahead and our keys and room were ready for us just like the hotel front desk had said they would be when we called to inform them we would be late. 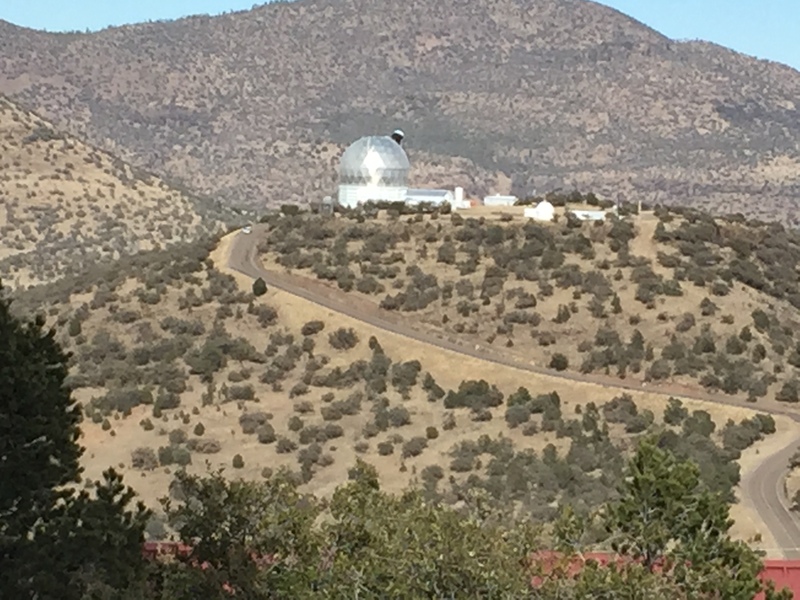 After our hike, we showered up and headed out to the McDonald Observatory. We attended the sun sighting program – where you view the sun via telescopes that are hooked up to a video link in the auditorium – still very interesting. Then we toured two of the telescopes, but did not get to look through them. Even if you are not a science fan, the program is very interesting. We stayed for the evening program as well, but by the time they were having the “Star Party” where they set up telescopes for the crowd, we were disappointed by a layer of clouds. Clouds, crowds and chilly weather drove us off the mountain and we headed back to the hotel. 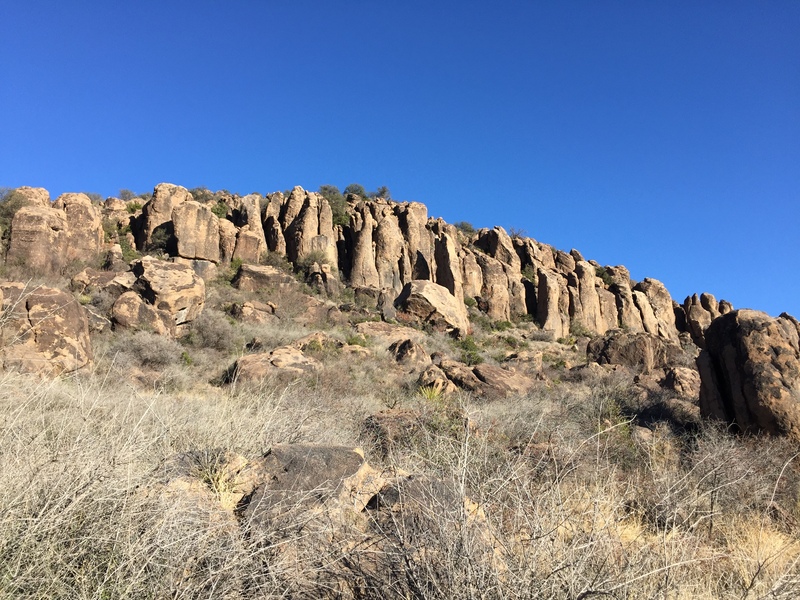 The next morning was the big hike – our plan was to start at Fort Davis, take the trail up the rim and along the ridge that ends at the entrance to Davis State park, and follow the Skyline Trail down to the Indian lodge. 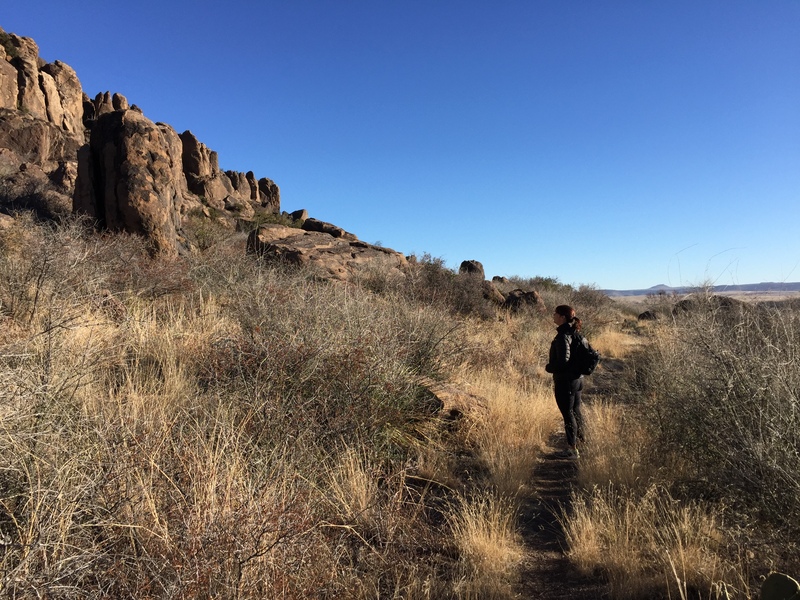 Then we would hike back along the CCC trail that leads back to Fort Davis. But first, breakfast! This time we tried to stop at another local cafe, but found that not everything was open on a Sunday morning, so we were back at the General Store for biscuits and eggs. We started at Fort Davis and took the first 45 minutes browsing through the displays and wandering through some of the standing buildings on the site. History buffs could spend hours here. 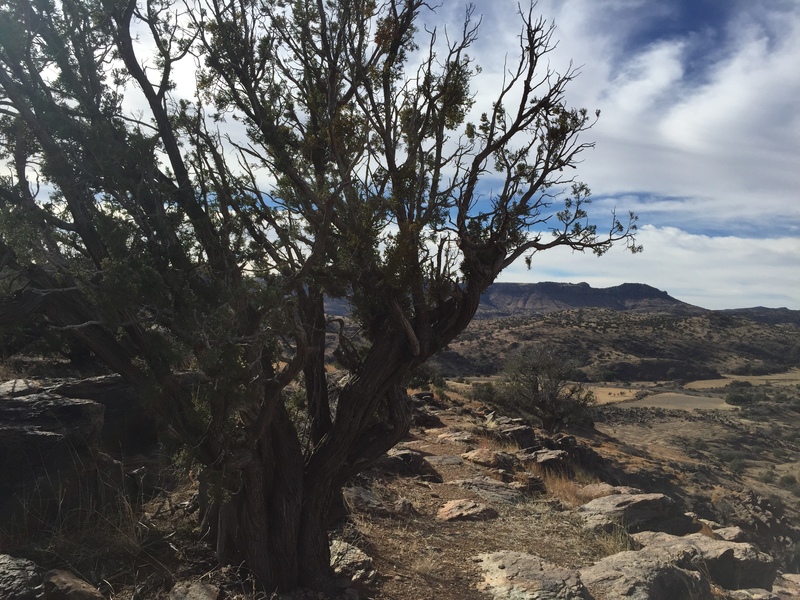 But, we were destined for a great walk through the rocks, hills, cactus and high desert grasses. 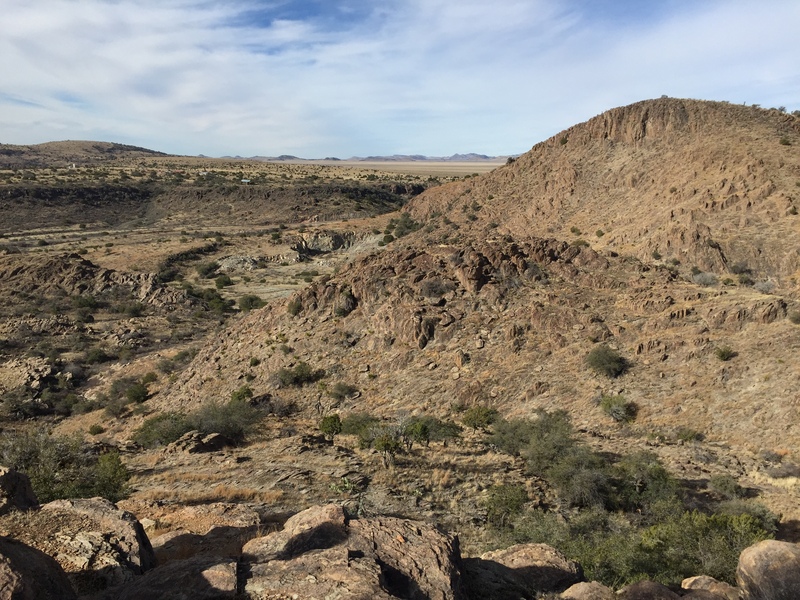 The hike in the Fort Davis area is on a very well marked and well maintained trail. There are many signs identifying the endemic plants. There are 3 overlooks, one of which gives you a nice areal view of the entire fort. At the boundary of the two parks there is a barbed wire fence with a nice opening and we crossed over to the Davis Mountain State Park. Once we were in the park, we went to the observation deck to overlook the valley, and onto the round observation tower where you have a nice all around view of the surrounding valley, and onto the hills beyond. From there, the trail is a little tricky to stay on – and we were often on the road. But with a little luck and a lot of looking, we made it to the high point of the ridge and then down the switchbacks to the amphitheater. Here was a turning point – we could either continue onto the Indian Lodge (adding another 2 miles) or head back on the relatively wide and easy CCC Trail. We opted for the later and alas, never made it to the Indian Lodge. Hiking back was an easy trail and over all we out for about 5 hours, 1 looking at the Fort and 4 hiking. Ready for a little relaxation – oh and a place to watch the NFC championship game between the SeaHawks (Go Hawks) and the Packers – Kerry and I showered up and decided to drive the 28 miles into Marfa, TX. For some reason, Marfa made it into Fodor’s “small towns of America 2014” list of places to visit. So I was curious. Kerry’s Grandfather had always wanted to move to Marfa, so she was curious. Marfa is also famous for the Mystery Lights that can be seen from outside town when you look into the eastern mountain range. Apparently the lights dance horizontally and vertically – and have been attributed to aliens among other theories. But Marfa is now more famous for a couple of artist outposts, and has attracted many more artists. When you drive through Marfa, what you see is a small somewhat sad eclectic Texas town with buildings that either need repair, were restored, were abandoned, or are in the process of being updated in some ultra chic version of hipster western. And, on the edges of town the requisite collection of cinder block homes with dead grass surrounded by chain link fences. We did find a very nice dive bar (Padre’s) and were able to find a great selection of beers and the game on 2 TV’s. More importantly, we found SeaHawk fans… great bar. Go Hawks (yes, they won!) After the game we went over to Jett’s Grill for burgers. The food was great – but since we wanted to sit in the courtyard of the Hotel and eat, our service was less than stellar. In fact it was horrible. So much for that place. Then we were off to see if we could spot the famous Marfa Lights. We tried. We sat out in the cold looking at the east mountains for a long time. We saw some lights that faded in and out, but were pretty sure they were just highway lights. In the end, we left without seeing the mystery lights. And that brought us to the end of the trip – well, we drove back the next morning and made the 6.5 hour drive go pretty quickly with our chatting. So I’ll sign off for now, and let you know that my next update should come in a couple of weeks to review Phoenix and the trip to the SUPERBOWL!